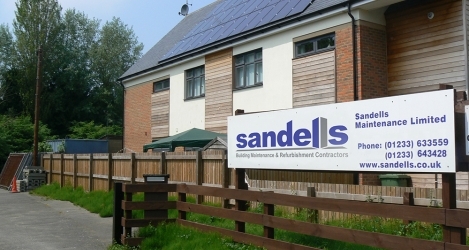 Sandells Maintenance Ltd is a building maintenance and refurbishment contractor based in Ashford Kent. Building on the best qualities already established and adding their own expertise and values, they are a thriving business carrying out works for a wide variety of organisations including housing associations, retail outlets, educational and business premises. Sandells Maintenance Ltd is still family based; everyone on the staff has a family or friendship connection with Guy and Jennifer which has created a team willing to go that extra mile all making Sandells Maintenance Ltd a stronger company. We are dedicated to satisfying our clients’ needs. We provide a varied range of services, offering a one stop shop approach for our clients’ maintenance requirements. We guarantee that our workforce offer reliability, good quality and value for money. Over two thirds of our workload results from repeat and recommended business. Working within the legal boundaries of, planning, building standards, health and safety legislation and best practice of the trade we have established excellent relationships in the locality and surrounding areas of Kent.